On the 9th February Chinese New Year celebrations will begin again. It’s the time of year where China’s ancient traditions are most evident – in every street littered with red confetti, in the red and gold banners pasted to doorways, in the faces of families gathered together for the first time in many months. Like Christmas in the West, Chinese New Year is a time for family. The elders are treated with particular honour and respect. Many Chinese people, especially from rural areas, work in the cities, and this holiday gives them a rare chance to reunite with their loved ones. Food, always an important part of Chinese life, is doubly important at New Year (known in Chinese as Spring Festival春节). Regional varieties abound – in the North, for example, they make a kind of dumpling known as jiaozi, to be eaten at midnight on New Year’s Eve. Making jiaozi is a fun communal activity, each member of the family responsible for a separate task – rolling out the dough, adding the stuffing, or (most complicated) wrapping it so that no stuffing escapes during steaming. If you are a guest with a Chinese family in the run up to New Year, chances are you will be taught to make jiaozi yourself. In the South a sticky cake called niangao is popular. And there’s always an enormous amount of food on the table; meat, fish, vegetables, local delicacies, and rice later on to fill you up. Television has influenced the way Chinese New Year is celebrated, and Chinese state television’s New Year Gala, broadcast since 1982, is watched by millions nationwide. The gala is a patriotic extravaganza with gaudy costumes, cheesy skits and children singing. Fireworks, invented in China, are the most obvious manifestation of the celebrations, and when Chinese people set them off, it’s more about creating noise than creating light or beauty. Although the government sporadically bans fireworks in public places, this ban is almost never enforced, even in the major cities. Young men compete by playing with fireworks at street level, and it’s common to look out from the window of your 18th floor apartment down on to a scene that sounds like gunfire. It’s not restricted to night-time either; originally intended to ward off evil spirits, fireworks are let off at all times – usually ending around 1am and beginning the next morning as early as 5 or 6. There’s slightly less noise in smaller towns and rural areas, but even fewer restrictions – children frequently wander round with large fireworks in their hands. The colour red is everywhere – in the banners pasted on doorways for luck, in the debris left by the firecrackers, in the small envelopes stuffed with money given to children, and in the lanterns hanging in shops and restaurants. Red is a sign of prosperity, good luck and happiness. If it is the year of your Chinese zodiac, tradition has it that you should wear red underwear for the entire year. This year experience Chinese New Year with China Holidays. As specialists in China, with over 10 years’ experience organizing holidays, we can help you with exclusive group departures or unique tailor made holidays to suit your own individual needs. China Holidays make sure to go the extra mile at all times to provide you with an unforgettable, experience of a lifetime. 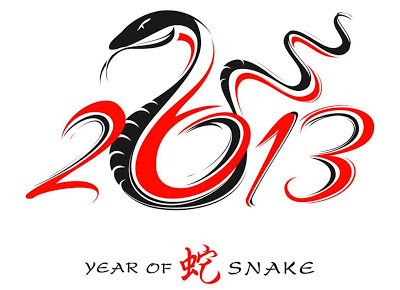 Happy New Year of the Snake !